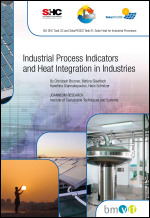 The goal of this report, developed in the framework of the Task 33 / IV – Solar Heat for Industrial Processes (SHIP) of the International Energy Agency, is to give an overview of the tools which have been developed within this IEA Task 33 / IV. 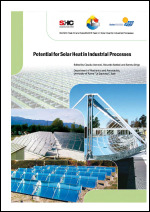 The goal of this report, developed in the framework of the IEA Solar Heating and Cooling Programme Task 33 and IEA SolarPACES Programme Task IV – Solar Heat for Industrial Processes (SHIP), is to highlight the potential use of solar thermal (ST) plants to provide heat for industrial applications. In order to fulfil this aim, several national potential studies were surveyed and compared with a focus on the key results and the methodologies applied. The use of solar energy in commercial and industrial companies is insignificant compared to solar’s other applications. However, the potential is great and the impact on energy use could be significant as the industrial sector is the largest consumer of energy compared to the transportation, household and service sectors in OECD countries. 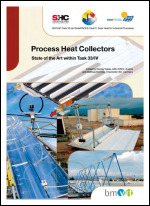 This report gives an overview and some background information on medium temperature collectors. This booklet presents a method to design solar thermal systems for space heating of factory buildings using underfloor heating systems. The method uses nomograms that were expanded upon using simulations of typical system configurations. There are nomograms for two different system configurations that can be used to determine reasonable values for the collector and storage tank size for a factory building with a known heat demand.